Your custom coin doesn’t have to be round – the 411th Military Police Company chose a rectangular shape with added thickness, to not only make a unique piece, but it fits their design as well. 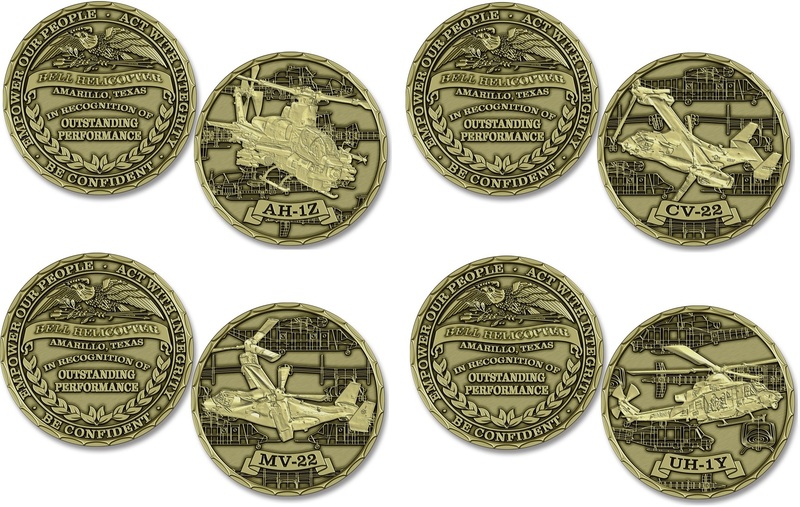 Some customers wish to produce a collectible set of coins, like Bell Helicopter/Textron did above in high relief 3D with an antiqued gold finish to make the details really stand out. When high detail is involved in a challenge coin design, an antique finish is always recommended. This set would look equally as good in antiqued silver plating. The design on the right is a glow in the dark challenge coin that gives an extra dimension of uniqueness. This feature can be added to any coin in any shape or size. Above, you may notice these coins have an epoxy coating that protects and smooths out the surface, which is a popular option on many Firefighter Challenge Coins. Three of the four military coins shown here are functional challenge coin bottle openers. Yes! They do actually open a bottle of beer or your other favorite beverage. If you are presenting at a special event or ceremony, consider the many challenge coin packaging options available to further personalize your order. Consider adding sequential coin numbering or engraving to identify order, rank, and membership. You can add special coin edging to any order that is round shaped. A variety of distinctive choices are available. The far right artwork shows how cutouts can be used in a conceptual design. Don’t think that all coins have to be round…we can make them any shape or size you could possibly come up with. Make your coins stand out from the crowd with dual plated metal, like high polished gold and silver displayed in the far right example. Learn more about these options on the challenge coin pricing page.